Alternative splicing of mRNA precursors enables cells to generate different protein outputs from the same gene depending on their developmental or homeostatic status. It is a complex process that allows the generation of protein variants from a limited repertoire of protein-coding genes in eukaryotic organisms. Its deregulation is strongly linked to disease onset and progression. 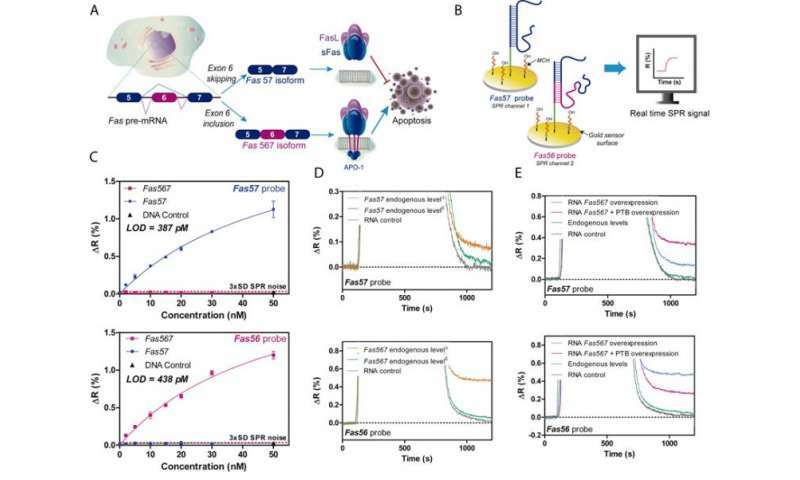 A recent paper in Biosensors and Bioelectronics reports a simple and robust technology using a surface plasmon resonance (SPR) biosensor for label-free monitoring of alternative splicing events in real-time. Current methodologies for monitoring alternative splicing demand elaborate procedures and often present difficulties in discerning between closely related isoforms, e.g., due to cross-hybridization during their detection. The new approach reported in the article does not require any cDNA synthesis or PCR amplification. The methodology was applied to RNA isolated from HeLa cells for the quantification of alternatively spliced isoforms of the Fas gene, involved in cancer progression through regulation of programmed cell death. The results demonstrate that the new biosensing methodology is isoform-specific, with virtually no cross-hybridization, achieving limits of detection in the picoMolar range. Similar results were obtained for the detection of the BCL-X gene mRNA isoforms. Deregulated alternative splicing patterns could be considered as a hallmark of cancer. Thus, the identification of alternatively spliced variants as biomarkers could cast light on cancer development. The biosensor technology developed by the ICN2 Group in collaboration with CRG researchers can greatly facilitate the exploration of alternative splicing biomarkers in disease diagnosis and therapy. Why do we study or learn about ideal gases?